4. If connected, an Uber driver-partner will arrive curbside at your location to hand off your gift (while supplies last)! *One VERY LUCKY person will also receive an unforgettable grand prize: a four day trip for two to the South of France!!! 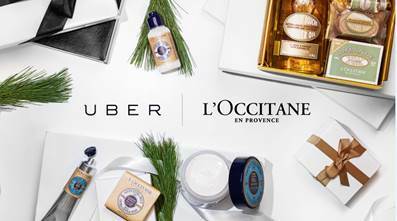 During the campaign, Uber will be teaming up with a different brand each day to give you FREE, on-demand, luxurious presents in NYC! Yesterday it was VINCE, today it’s L’Occitane’s turn and the next few days it will be other spectacular brands.